Lowell Miller, in his book, “The Single Best Investment” makes the statement, “Long term investing is about character, about depth of vision and the cultivation of patience, about who you are and who you’ve made yourself to be.” There is no successful investor gene, and they aren’t able, yet, to clone Warren Buffett. Successful investors are made, not born. 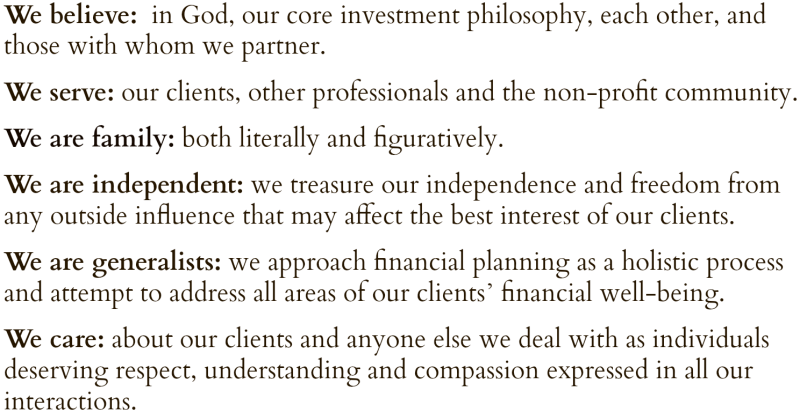 We always try to educate our clients concerning what it takes to be a successful long term investor. As Miller states, it takes a depth of vision that enables the investor to see long term results through the cloud of pessimists, the hail of a volatile market and the storm of recessions. Investors must cultivate patience. They must establish reasonable goals and expectations and, above all, avoid the siren call of the doomsayers and end of the world prophets. I think most of you have heard my speech about our economy experiencing a recession (a decline in value of 20% or greater) every 5.7 years on average since The Great Depression. As of today our current economic recovery is at six years. The eleven bull markets since 1950 have averaged only 4.9 years.